It’s official! 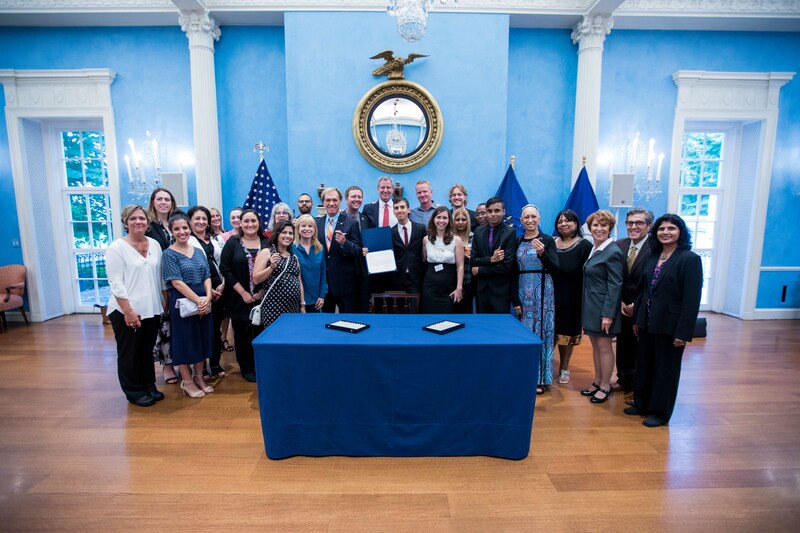 The bill to ban the use of wild animals in circuses is now signed into law by Mayor de Blasio! Last night at Gracie Mansion, we were honored to join the Mayor to commemorate this major milestone for animals rights. When the legislation was first introduced in 2006 by Council Member Rosie Mendez, no one imagined that cities, states and even countries all over the world would enact this kind of legislation. Back then, the political leadership in NYC was strongly opposed to even the most modest reforms. Still, there were some elected officials who were willing to use their power for animals. Bill de Blasio, then a Council Member, was one of them. He proudly supported and co-sponsored this bill the first time it was introduced — and he’s stood up for it ever since. Despite the uphill battle, Council Member Mendez never gave up. She introduced the bill three times. The legislation was a tool to educate the public and City Hall that wild animals used in circuses endure cruel training techniques, constant confinement, and consistent deprivation of all that is natural to them. It worked. In early 2016, the stars began to align with Intro 1233. By October, thanks to Council Member Corey Johnson’s powerful advocacy and leadership, the bill got it’s first public hearing. By January of this year, Ringling Bros and Barnum & Bailey Circus was shutting down after 146 years of exploiting animals. It’s undeniable that the pressure of fighting local ordinances, especially in the nation’s largest city, combined with protests, drove them to make this historic decision. Still, there were other circuses using animals in NYC and they weren’t going away without a fight. So we redoubled our organizing efforts. On June 21, 2017, the NYC Council, with the support of Mayor de Blasio, voted 43 to 6 to ban the use of elephants, tigers, lions, bears, zebras, ostriches, and other wild animals in circuses. This victory for the humane voter movement will have a ripple effect around the world. It affirms that majestic animals used in circuses are exploited victims, not willing performers. It also proves that we can make significant gains for animal rights by being involved in the political process. Not only by lobbying, but by supporting candidates for elected office who will fight for animal rights. Mayor de Blasio is sending a powerful message: Animals do not exist for our entertainment. Please join us in thanking the Mayor.